Cream-spot Ladybird by Andrew Jewels from the Galleries. Many thanks to the photographers who continue to populate this on-line guide with the most extensive list of images anywhere on the web. Images illustated below have been kindly contributed by Brian Bullough. Andrew Easton, Dan Houghton, Mark Hows, Andrew M Jewels, Neil Loverock, Damian Money, Marc Read, John Reeves and Joshua Reeves. 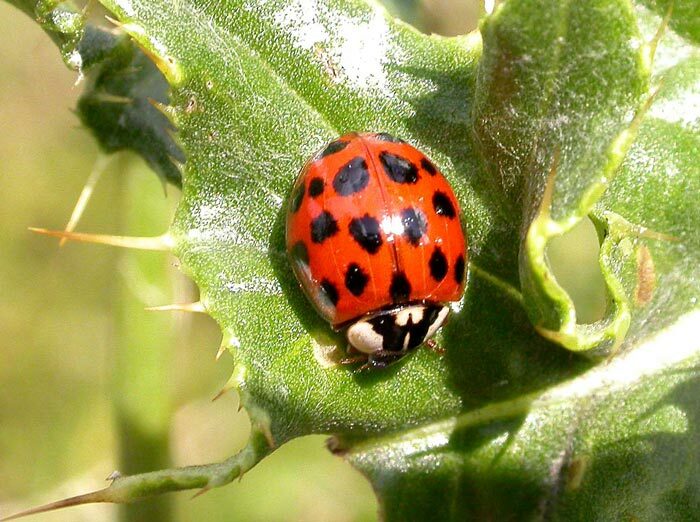 The UK Ladybird survey contributes to our understanding of the distribution and ecology of ladybirds in the UK and is helping scientists assess the impact of environmental changes and introduced species. 7-spot Ladybird Coccinella septempunctata (more images) Widespread in Britain, usually found around low herbage. The species generally has seven spots, three on each wing case with a further spot lying across the two wing-cases. It has black legs. 2-spot Ladybird Adalia bipunctata (more images) Widespread in Britain but rare at high altitudes; usually found in houses, sheds and under loose bark. The 2-post can be very variable in appearance; a common form has two spots, but it can have up to ten. The pattern can be reversed especially where pollution is high. 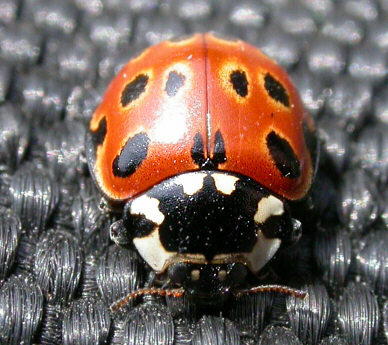 The 2-spot always has a black underside with black legs. Water Ladybird Anisosticta novemdecimpunctata (more images) Widespread in Britain in reed-beds and wetlands; this species is usually beige turning reddish in spring. It has between 15 and 21 black spots on a flattened, elongated body. Cream-spot Ladybird Calvia quattuordecimguttata (more images) Widespread in Britain in deciduous woodland and hedgerows. A chestnut brown ladybird with fourteen cream spots and brown legs. 10-spot Ladybird Adalia decempunctata (more images) Widespread but local and declining in Britain, usually found in deciduous trees and hedgerows. A very variable ladybird with more or less than 10 spots. Often it is orange-red but another common colour form is all black. This species usually has a red-brown underside with brown legs. 14-spot Ladybird Propylea quattuordecimpunctata (more images) Widespread in England and Wales in a variety of habitats but scarce in Scotland. 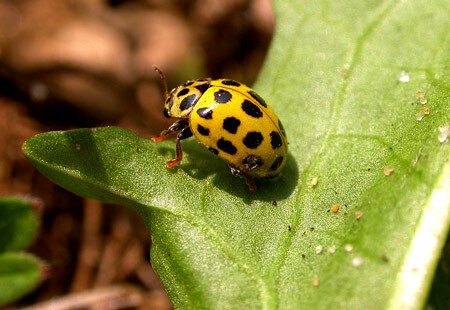 This black and yellow ladybird has an irregular chequered appearance with between 4 and 14 spots and brown legs. Eyed Ladybird Anatis ocellata (more images) Widespread in Britain in needled conifers. 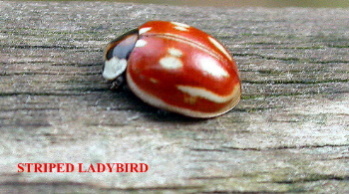 The largest native British ladybird with up to 23 black spots on a russet background. 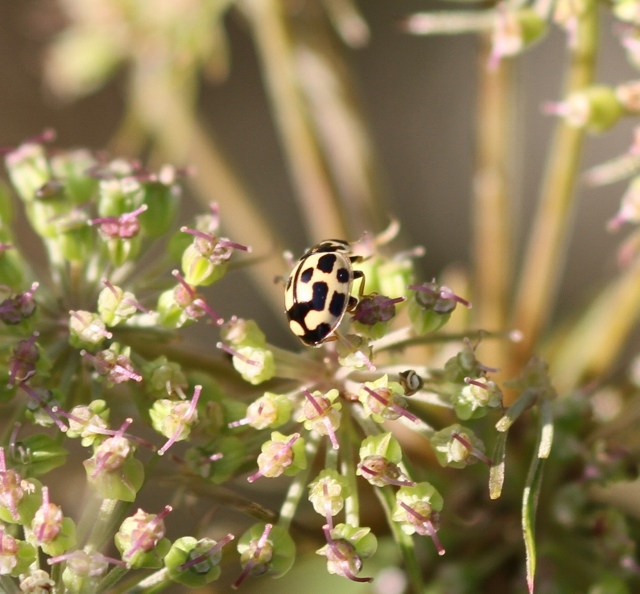 Black legs help to distinguish it from the Harlequin ladybird. Orange Ladybird Halyzia sedecimguttata (more images) Widespread in deciduous woodland in southern Britain including Wales but more localised further north. This ladybird has an orange body and legs with between 12 and 16 spots. Kidney-spot Ladybird Chilocorus renipustulatus (more images) Widespread in deciduous woodland in England but scarce elsewhere in Britain. 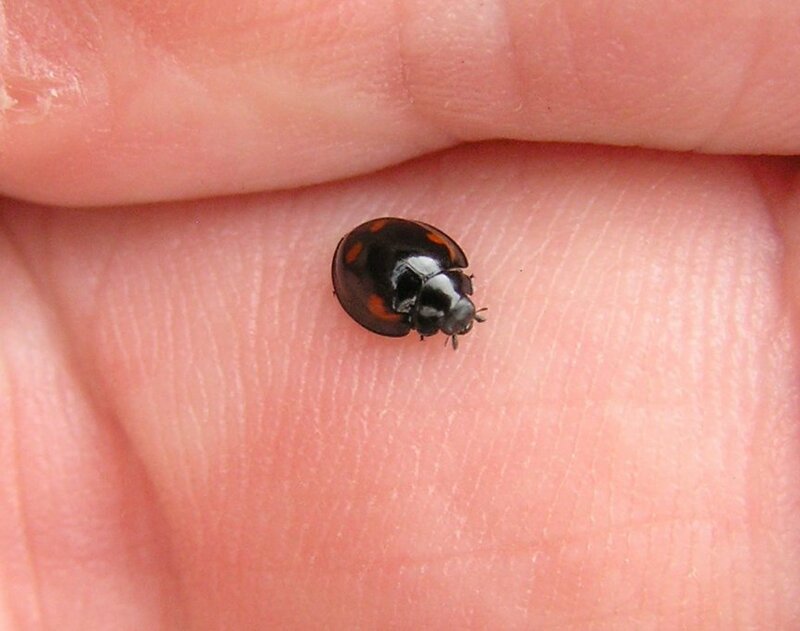 This Ladybird has a black body and legs with two red spots and is round and dome-shaped. 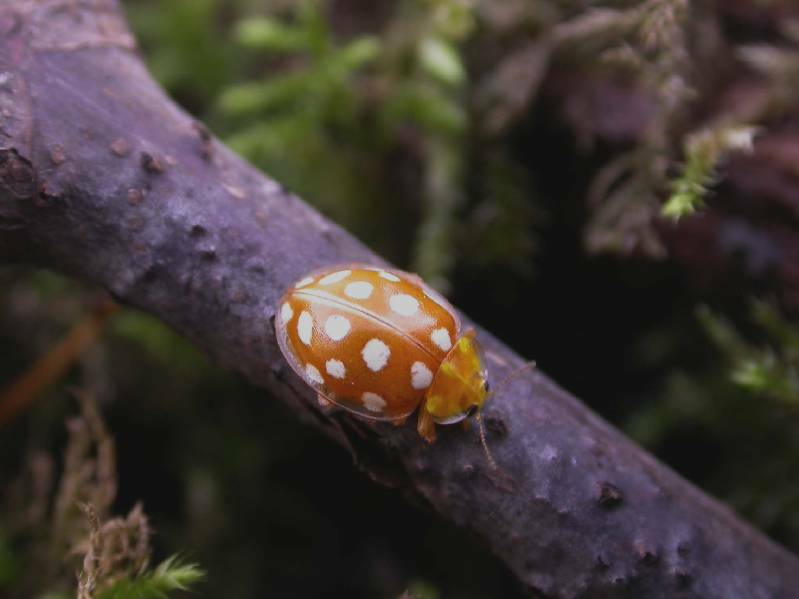 22-spot Ladybird Psyllobora (Thea) (more images) Widespread in low vegetation in Britain but scarcer further north. A yellow herbivorous ladybird with 22 spots and brown legs. Heather Ladybird Chilocorus bipustulatus (more images) This species is similar in shape to the pine and kidney-spot ladybirds with a narrow, linear red stripe running across each wing-case which may be broken into two or three thin spots. In Britain it is only found on heather or on conifers nearby. Pine Ladybird Exochomus quadripustulatus (more images) The species is another of the mainly black ladybirds which live on scale insects. 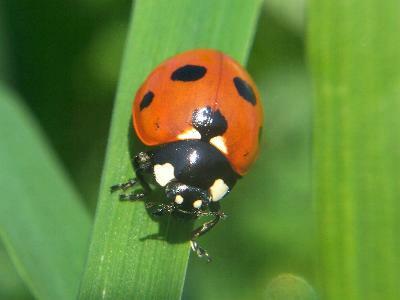 Over the last decade it may have become the mostnumerous ladybird in Britain often seen on urban lime and sycamore trees. Cream-streaked Ladybird Harmonia quadripunctata (more images) Another large species of ladybird which lives on pine trees  but is more common than the striped ladybird. It is quite variable and may have no spots or up to sixteen. Striped Ladybird Myzia oblongoguttata (more images) Another tree-dwelling ladybird. This large species is found only on Scots pine. It may have up to 15 stripes/spots. Harlequin Ladybird Charmonia Axyridis (more images) One of the most invasive species in the world having been introduced to Europe from Asia to control aphids. First found in southern England it is rapidly spreading northwards. A prolific breeder that may well be competing with the native 2-spot Ladybird. A very variable ladybird making identification difficult but the combination of large size, brown legs and M-shaped pattern on their head should be sufficient to confirm identification. 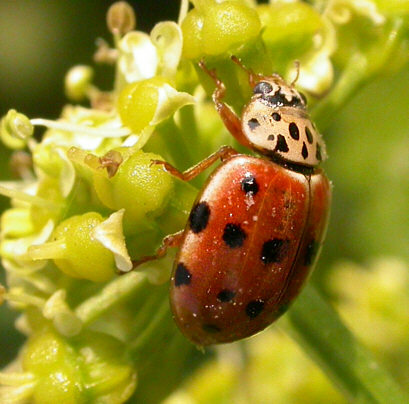 Other species of ladybird recorded in Britain.